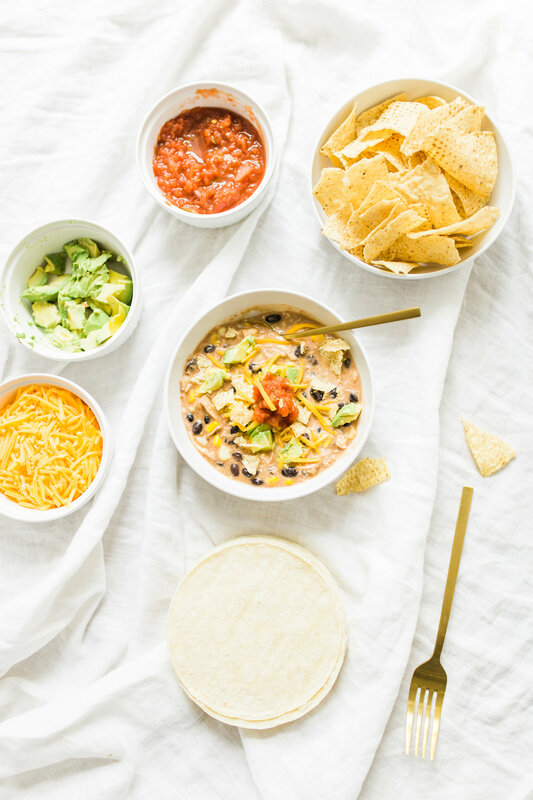 Easy Tortilla-Less Crockpot Creamy Chicken Enchilada Soup | Glitter, Inc. 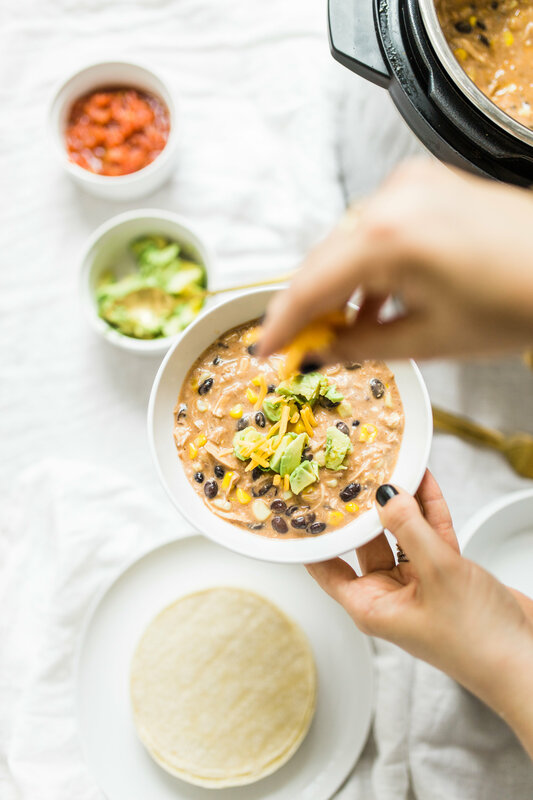 This easy tortilla-less creamy chicken enchilada soup can be made in a crockpot or Instant Pot – a.k.a., dump it and forget it. 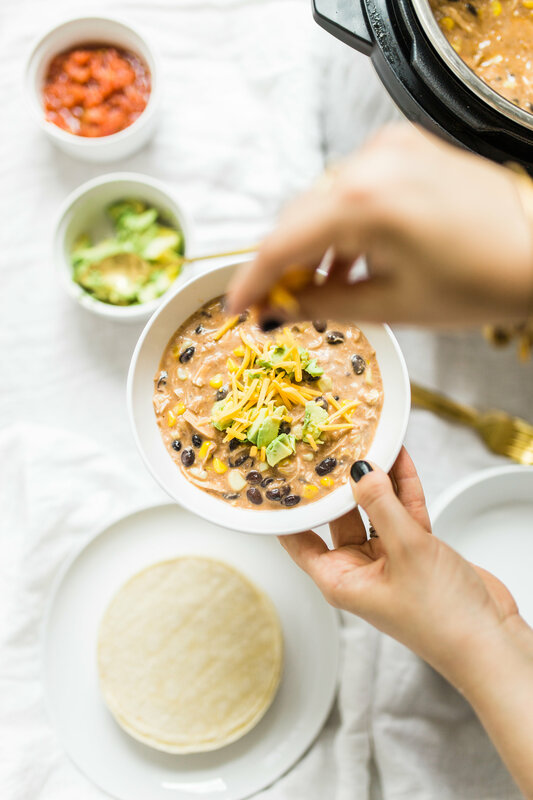 It’s delicious, hearty, and our whole family loves to eat it with all of the taco fixings: shredded cheddar cheese, fresh avocado, cilantro, scallions, sour cream, salsa, chips, and a squeeze of lime. This is as yummy and simple as dinner gets! I’m amazed at how many amazing things you can make in a slow cooker, all while doing very little work. 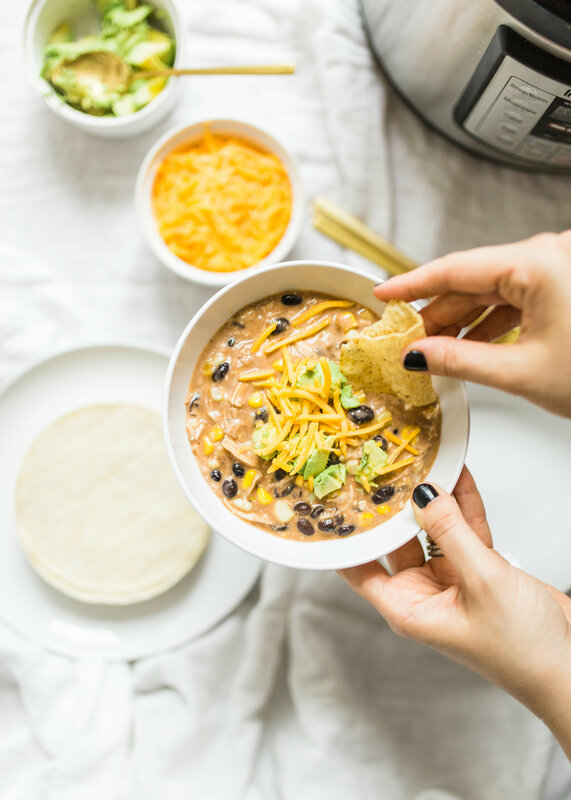 And let me tell you, now that I’ve hopped on the bandagon, I’m all for the easiest possible Instant Pot dinner recipes … as in, super easy. Also I like the Instant Pot and slow cooker recipes that require nothing more than dumping a bunch of stuff in the pot, pressing a few buttons, and strolling back into the kitchen a few hours later to find dinner ready. YASSSS!! Granted, there are some crockpot meals that require a little more TLC; i.e., browning meat and veggies first, cooking in stages, etc., but I mostly steer clear of those recipes, because, you know, if I’m going to attempt to make my life easier with a barrage of crockpot dinners, I plan on doing it the EASY way. Because let me just say, for our family, easy dinners are where it’s at. I’ve always been a big fan of cooking, but the busier we get, the harder it is to open up a recipe book and throw together an elaborate meal to serve on a random weekday night. 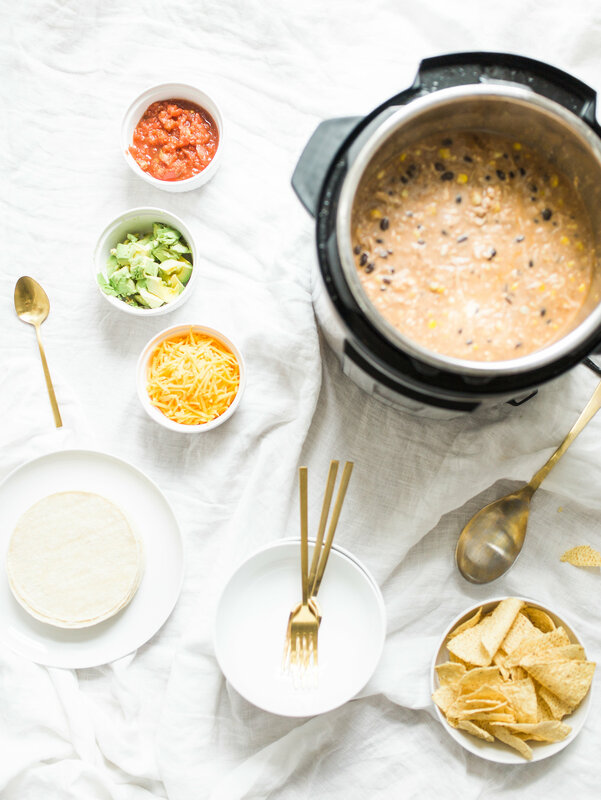 If you haven’t yet scooped up an Instant Pot of your very own, it’s time. These things are all the rage. Sometimes, I’ll really get into a kick and serve our poor family dinner out of our Instant Pot for weeks at a time. It’s like a black hole of simple dinners. And the best part: not one complaint from the family. I actually think the crockpot meals ar emy girls’ favorite meals. 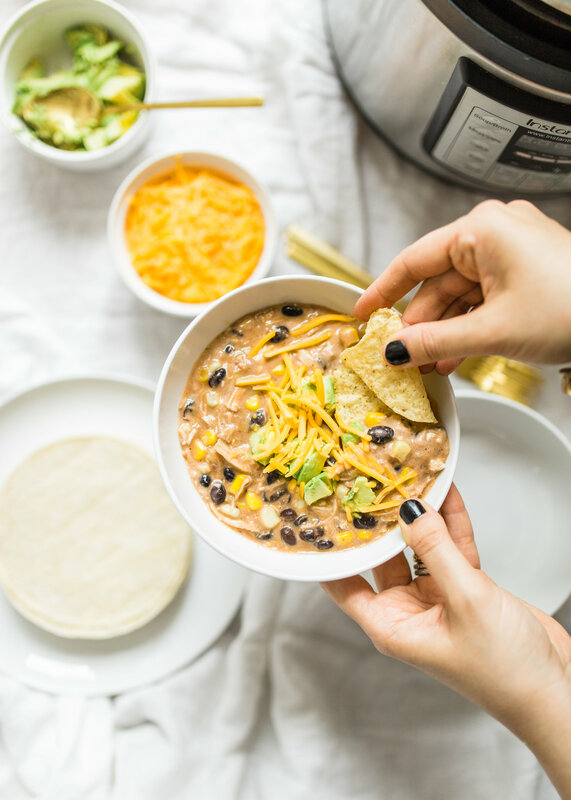 Our super easy crockpot tortilla-less creamy chicken enchilada soup. I make a big pot of these tortilla-less crockpot creamy chicken enchiladas, and then serve it with all of the fixings. 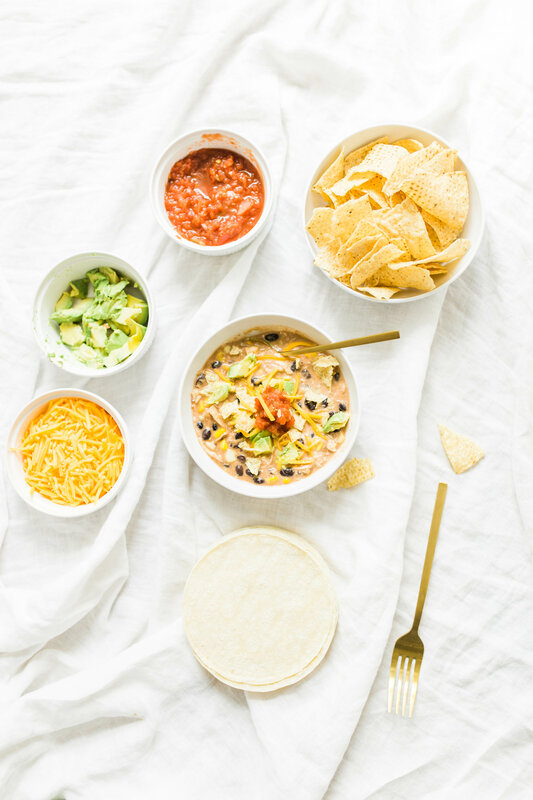 We like to set up a taco bar type station, with fresh avocado, salsa, sour cream, shredded cheddar cheese, and then either tortilla chips, tortilla wrappers, or both. Everyone gets to eat their enchilada soup/chili however they like! You can also top your enchilada bowls with scallions, fresh lime, corn chips (like fritos), etc. These tortilla-less crockpot creamy chicken enchiladas may not look gorgeous, but they taste amazing. Our oldest, Scarlett, is actually allergic to milk protein. So I don’t typically add the cream cheese until the end (i.e., after she’s been served.). 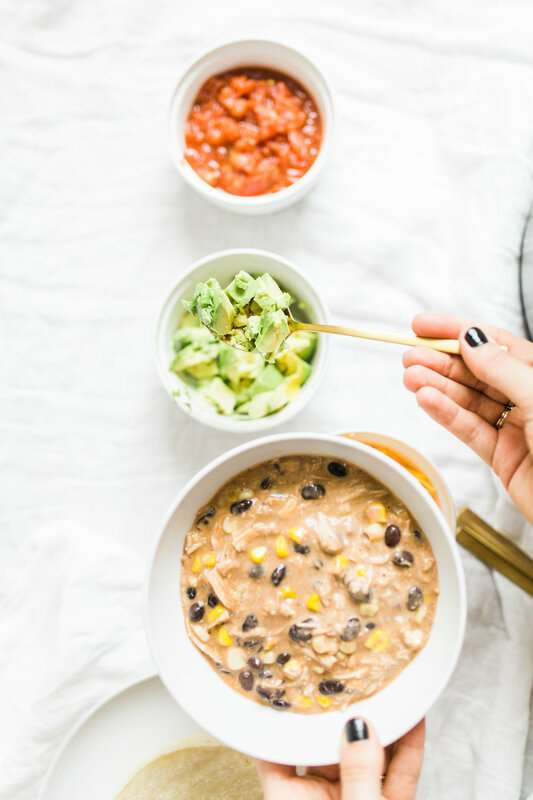 She loves the dairy-free version of these crockpot enchiladas, and happily devours it with tortilla chips and salsa. I for one, am all about that fresh avocado. 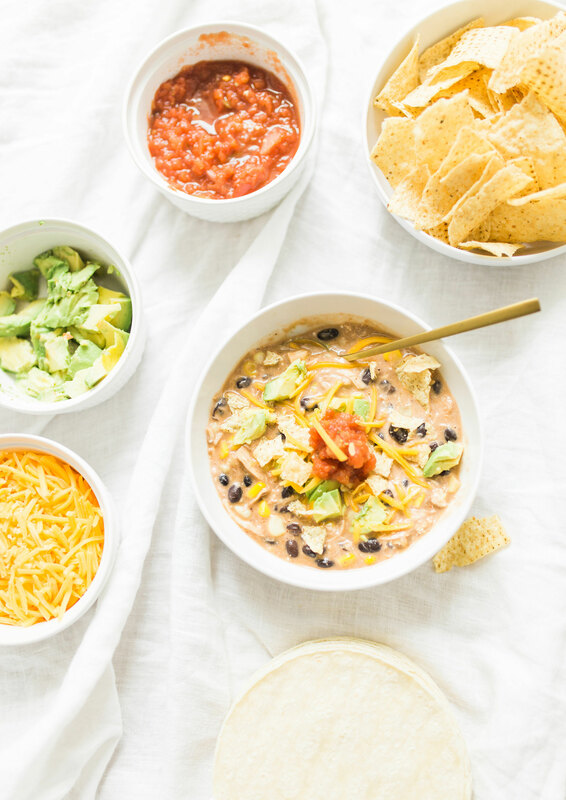 This easy and delicious creamy chicken enchilada soup is made in a crockpot or Instant Pot - a.k.a., dump it and forget it. Our whole family loves it! 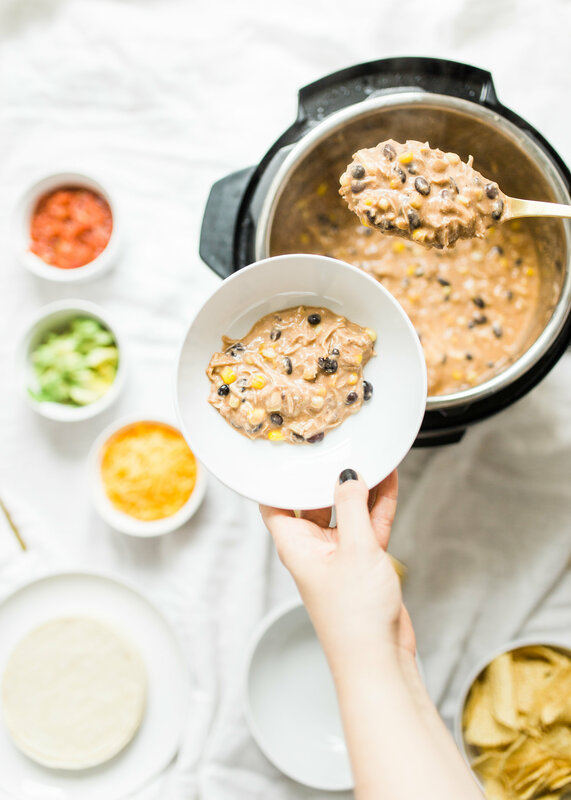 In a large crockpot or Instant Pot, pour in the enchilada sauce, drained and rinsed black beans, frozen corn or drained canned corn, and raw chicken breasts. Top with chicken stock. Cover and place on high for 3-5 hours (or until chicken will easily shred) or low for 5-8 hours (again, until chicken will shred easily). Remove the chicken from the crockpot and shred in another bowl using two forks, or in a stand mixer. Meanwhile, cube the cream cheese into small cubes (it should be very softened) and put them in the crockpot. (I typically only use a half stick of cream cheese, though you can easily put a whole stick if you like your enchiladas nice and creamy.) Stir well and cover. Allow the cream cheese to melt, stir well, and serve with all of your favorite toppings. Add the shredded chicken back into the crockpot. Stir and cover. Cook on high until all the cream cheese is completely melted. Stir. Serve with sour cream, cheddar cheese, avocado, and fresh cilantro as desired. If you only do one topping, to me, cheddar cheese is a MUST! 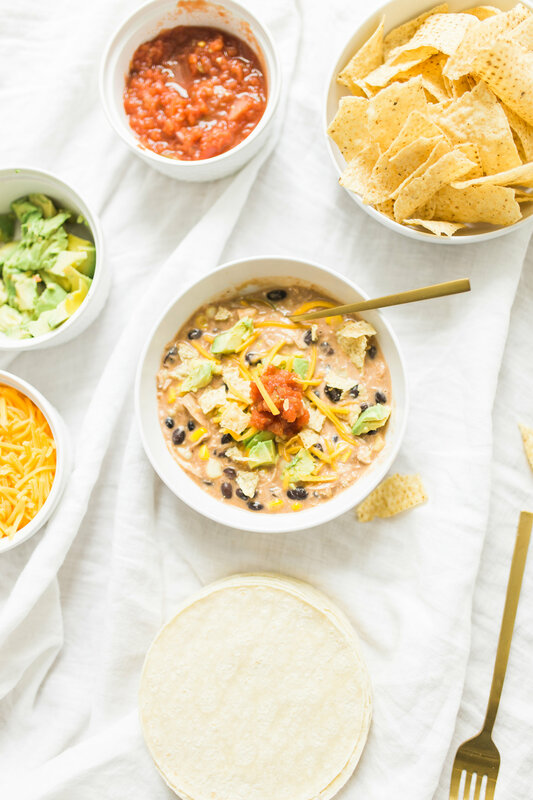 If you’ve been searching for an easily family dinner, this easy crockpot creamy chicken enchilada soup is sure to be a favorite. My family absolutely devours it, and it takes so little work on my end, that I’m tempted to make it every night of the week. 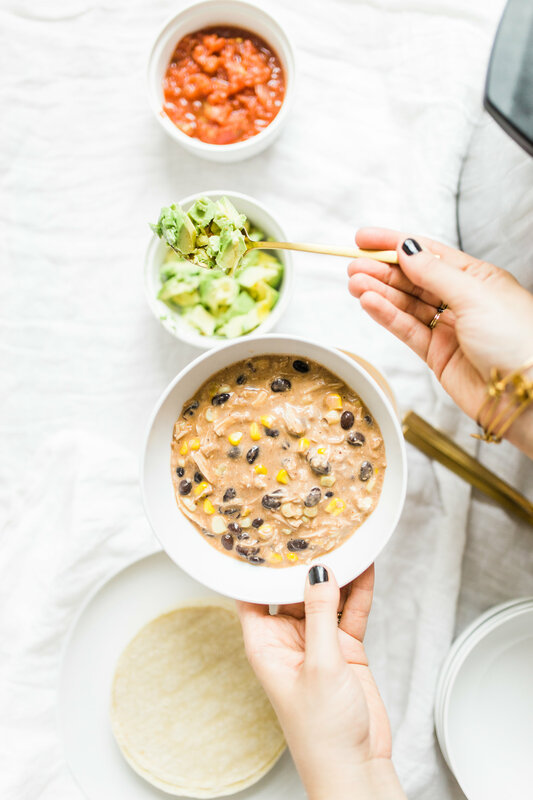 LOVE THIS CROCKPOT CREAMY CHICKEN ENCHILADA CHICKEN SOUP? HEAD TO OUR RECIPE PAGE TO CHECK OUT WHAT ELSE WE’RE WHIPPING UP IN THE KITCHEN!